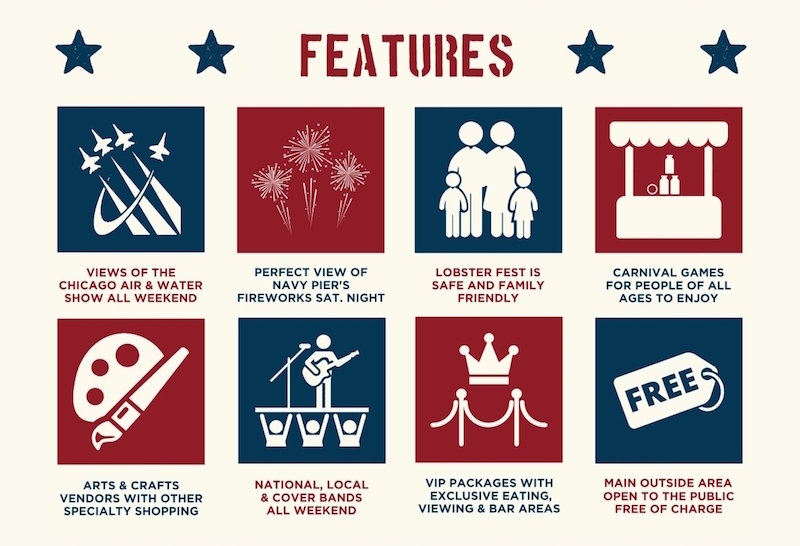 The Great American Lobster Fest is the Midwest’s largest Lobster Fest and is returning again to Navy Pier for it’s 2nd year. Enjoy live lobster flown in fresh from Boston. Enjoy amazing food and cold beverages along with live entertainment and family-friendly games and activities. Shop unique crafts and specialty vendors. The festival also takes place during the Chicago Air & Water Show, so there will be jets flying overhead. And on Saturday night, stick around for Navy Pier’s fireworks show. Food will be served from 10am to 9:30pm each day. Advanced meal tickets are available for purchase here and includes the lobster meal along with a ticket to the Grand Ballroom to see the musical performances. The main outside festival area at the end of the Pier will be open to the public FREE OF CHARGE. There you’ll find food tents for Day-Off food purchases, including new Surf & Turf options for steak lovers and many other great food options, if you’re not digging the lobster. That’s also where you’ll find the shopping vendors, carnival games, and the Bud Light Beer Garden experience. Portion of all proceeds benefit Mr. Bones And Co, an all-volunteer based 501(c)3 animal welfare non-profit committed to supporting animal rescue and advocacy.